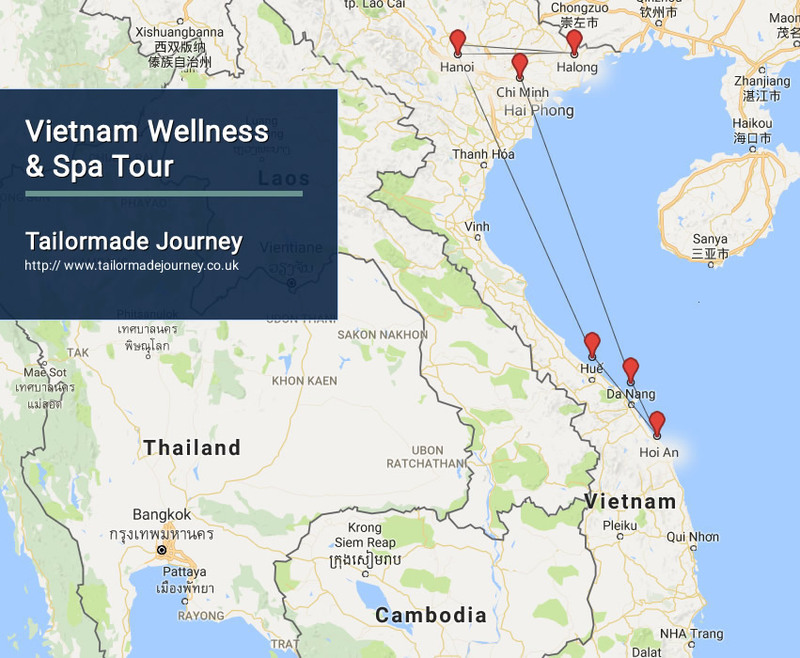 Vietnam is the new spa destination in South East Asia, home to several of the world’s best spas, centuries-old massage techniques, and delicious, healthy cuisine. This luxury spa of Vietnam tour includes leisurely stays at the best spa resorts—providing ample time for you to focus on the treatments and activities of most interest to you.This is an ideal spa vacation for anyone seeking an exotic location, the flexibility to choose your own spa program, and daily private chauffeur and expert guide to introduce you to the local culture at your own pace. Dead Sea Salts combined with a revitalizing essential oil blend is massaged over the body in a brisk light motion to deeply cleanse, exfoliate, and stimulate circulation. Leave SAIGON to lush My Tho where we cruise on a private boat through the green vegetation of the canals to an orchard, where we are treated to a delicious lunch in a local restaurant in the heart of the Mekong , complete with tropical fruits. We also visit the snake farm Dong Tam that breeds snakes for, among other things, snake wine before heading back to SAIGON. Today is a free day for you to discover the SAIGON, shopping, relax, unwind or take a half day trip to visit Cu Chi tunnels: At its height, the tunnel system stretched over 250km. from Saigon to the Cambodian border and was three levels deep. The network included innumerable trap doors, specially constructed living areas, storage facilities, weapons factories, field hospitals, command centres and kitchens. Today the remaining tunnels have become a major tourist attraction giving the visitor a unique experience and a feel of what underground life during the U.S.-Vietnam War must have been like. Yoga or Tai Chi session at the Open Lounge in the morning and Leisurely breakfast at The Restaurant! You leave Hoi An for Hue. Afternoon you board on a Dragon Boat for cruising on the romantic Perfume River to visit the charming Thien Mu Pagoda. From here you will continue drive to visit the ornate Minh Mang’s tomb and Tu Duc tomb. Enjoy Hue Royalstyle dinner at local restaurant (joining dinner or private dinner if the no.pax is from 10pax). Breakfast at the hotel! Then you have free time before transfer to Phu Bai Airport, Hue and enjoy a short flight to Hanoi for a three-night stay. Meet and greet at Noi Bai International airport, Hanoi and transfer to hotel in town. Free time and optional cyclo ride around the Old Quarter. Then go to dinner at a popular restaurant in the Old Quarter of Hanoi. In the evening enjoy a traditional Vietnamese water puppet show at Thang Long theater. Vietnam ‘s artistic and intellectual capital. Full day visit Hanoi’s main cultural attractions, including the Ho Chi Minh Mausoleum, his House on Stilts, the One Pillar Pagoda, the Fine Arts Museum and the Temple of Literature, Ethnology Museum . Explore the fascinating Old Quarter and its hundreds of specialty shops selling silk clothing, lacquer-ware, embroidered linens, furniture, bamboo, cooking utensils, ceremonial objects and more. Walk around the Hoan Kiem Lake! Lunch in French colonial villas converted into gourmet restaurants. Enjoy people-watching at stylish cafes. Shop for impressive modern art in the city’s myriad galleries. Using leaves, roots, barks from many indigenous plants, this herbal Spa package design to heal, relax and rebalance your spirit and body. Each ingredient has its own power. For example, cucumber is the best astringent to cool off your skin and make it tight. This package includes: herbal hair treatment (60’), facial treatment with yogurt, honey and cucumber (60’), body massage with yogurt and honey (60’), hand and foot mail trimming (30’). Pick up from your hotel in Hanoi at 8:30 am for a four-hour drive through the Red River Delta to Ha Long City. Warmly pick up at your hotel lobby and leave Hanoi for Halong Bay. Your heavenly voyage across Halong Bay starts around noon on Tuan Chau Island at the doorstep of Vietnam’s most fascinating wonder. As the vessel sets sails, you will be greeted by Halong cruise and Cruise Manager who will aim throughout your stay at providing you with the highest standards of service for a pure pleasure and utmost comfort onboard our luxury facilities in the stunning surroundings. Discover some of the treasures disseminated across the Bay of the Descending Dragon during the afternoon: fascinating caves, pristine beaches, picturesque floating villages, fantastic rock formations rising up out of emerald water. Duong Lam Ancient Village has a history of about 1,200 years with many houses dating back up to 400 years and well-known for its surviving literate brick houses, built three to four centuries ago. Literate is red clay formed from weathered basalt found in northern Vietnam. It is also famous nationwide as “the hometown of two kings”. You will drive about 65 km from Hanoi to visit Duong Lam ancient village in Son Tay province. Duong Lam, a purely agricultural village of the Northern Red River Delta. On arrival we take a walk on the village path to visit Mong Phu temple where is dedicated to national heroes, King Ngo Quyen temple and King Phung Hung temple. Enjoy Vietnamese special Vietnamese lunch in an ancient house. While you are in the house you can also join the local people in producing local specialties such as soft green-lentil cake and rice cakes filled with brown onion and enjoy these products (Depends on the season of the year). Continue to visit Mia Pagoda – built in 15th century and admire 287 statues of all sizes before transfer back to your hotel in Hanoi.